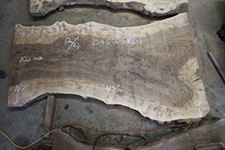 At Baker Hardwoods we produce chainsaw milled, live edged slabs for specialized furniture production. Located in Gilroy , CA. 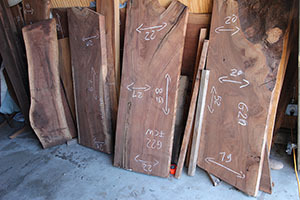 , we specialize in Claro walnut. 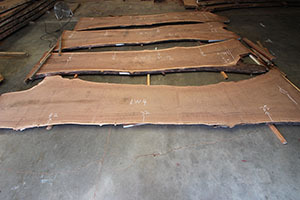 We also carry a supply of other species such as elm, bastonge, and cedar. 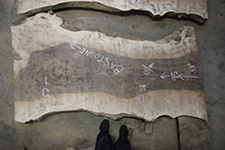 Nearly all of our slabs have been air dried for no less than 4 years AND kiln Dried. 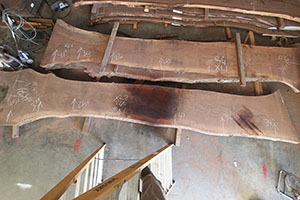 We do not document slabs for sale that are still green. Most of our slabs are resposibly and locally sourced. Many are reclaimed logs from trees felled due to construction. 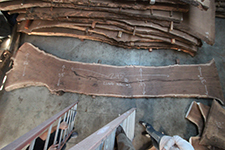 We even have a flitch of slabs sourced from a log rescued from an orchard burn pile! 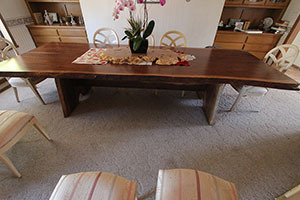 Below are some examples of table tops made from our hardwoods as well as some recently documented slabs available for sale. 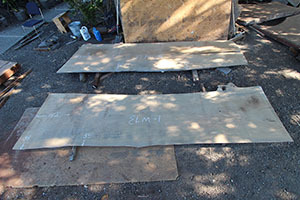 We sell unfinished slabs, however if needed we may be able to assist with surfacing needs. Please call us for inqueries on our slabs. We prefer to conduct business via telephone to ensure the best service. Bastogne1. Bastogne slab with amazing figure. Call for price. 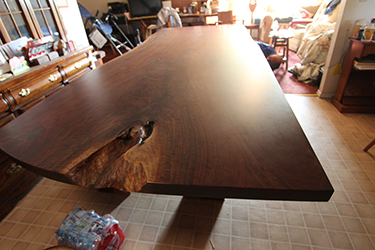 Below is a dining table made from a massive Bastonge slab. Fig 2. 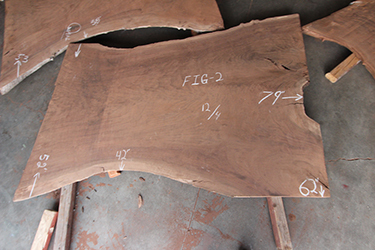 Figured claro walnut slab for sale. 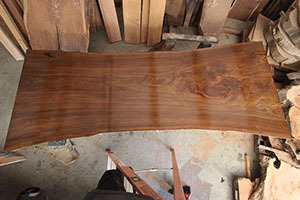 MEWAL 15 Claro walnut slab for sale. 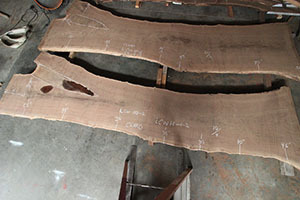 FYS-2 Claro walnut slab for sale. LW4. 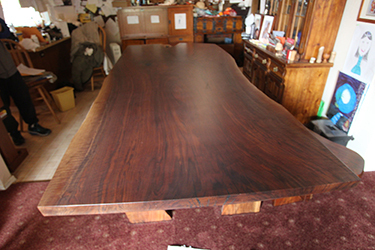 Long claro walnut slabs Example of a finished Elm table with a dark finish. 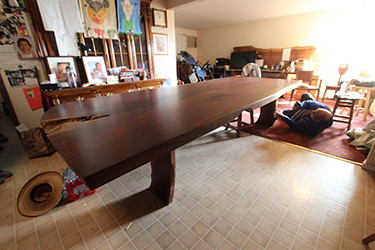 Example of a claro walnut table. We are now offering custom milling services. 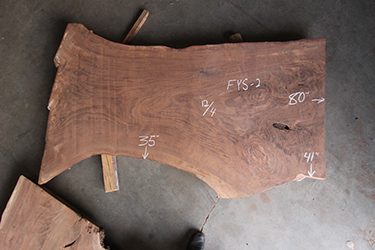 Do you have large pieces of lumber that you need milled to a specific, more managable size? 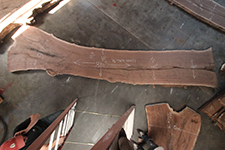 contact us about arranging a visit and use our mills to cut your wood! 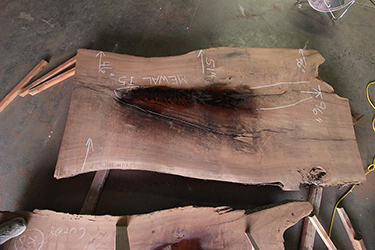 We can resaw material up to 24 inches wide. We have unphotographed small slabs available at bargain prices for local hobbyists. These prices are usually not availabe on shipped orders, as the shipping costs are usually higher than the actual price of the wood! Only in person pickups, please to assure customer satisfaction. Please call us to arrange a viewing appointment if interested. If you want to visit, please call us at (408) 847-8433 to arrange an appointment to view inventory on location. We don't have a retail store so when you visit our mill, we want to be sure someone is here to help you. If you would like information on a listed slab, please call. We prefer to discuss details over the phone rather than email.